*If you sign up for Airbnb using my referral link you will get you will get a $40 USD credit for your first trip of $75 USD or more! The road trip is the quintessential American vacation, as referenced in this previous post. Over the years our little family has mastered the art of road tripping: we have learned to drive long hours, become pro Google Maps navigators, keep two active dogs happy in the back seat (well, at least one of them…) and leave room for unexpected adventure. Just as I finally felt we had become road trip experts, a big change occurred. And turned the whole game on its head. Road tripping while pregnant is a whole different ball game. Accommodations must be made, and plans may change more often than usual. But road trips are as doable for pregnant women as any other form of travel (especially in the second trimester!) My recent Oregon Coast road trip was not only enjoyable, the slower pace made me appreciate it even more than usual! This was by far the day with the most driving. We set out around lunch time, with three people and two dogs in our Subaru. Since we were trying to get from a big city out to the coast, the drive just to get to our first stop took 3 hours itself (with some stops). We had the calm beach all to ourselves at Cape Disappointment (read about the history of the name here), and an unusually sunny day on the coast. After enjoying the solitude of the ocean we headed to Astoria, a cute town on the Columbia River, which separates the states of Washington and Oregon. The highlight of the town was spending sunset watching the resident sea lions on the docks. We ended off our day by grabbing dinner at Fort George Brewery & Public House, where I was served the largest portion of vegetarian chili fries I have ever seen. From there the drive to our Airbnb took another two hours. This is a picture of the sea lions on another trip we took to Astoria, since it was already dark when we saw them this time! If you have been experiencing morning sickness (really, it’s all day sickness for a lot of women) be prepared that you may need to puke while in the car. I have puked while trying to eat bananas in the car, and on another road trip this pregnancy I puked my breakfast up three times before I could keep it down. After awhile, it becomes shameless and routine. On this particular day, for seemingly no reason at all, I needed to vomit. I became acquainted with a Subway bathroom very well. Keep a bag handy in the car at all times, and do not be ashamed if you need to find a fast food chain or a gas station or the side of a road. Whatever makes you feel better! Day Two started with breakfast in nearby Lincoln City, at Corner Cafe. They have standard breakfast options, and the portions are quite large. From there we headed to a secret entrance around Siletz Bay Beach, that is usually empty and gives the dogs lots of room to run around. We had finally made it to the Oregon Coast! After tiring the dogs out, we continued our journey back up North. We stopped at a beach we had never been to: Hug Point State Recreation Area. I can confidently say that it tops the list of my favorite beaches along the Oregon Coast. Although there were quite a few people, the beach is so long that you can escape them pretty easily. The water here was the clearest I have seen in Oregon, and the sand was so golden. We caught sunset at Cannon Beach, Oregon’s most famous beach. The huge haystack just off shore attracts over 400,000 people each year. If you happen to go during low tide there are interpretive guides that can help you explore the Marine Gardens surrounding the rock. Officially 16 weeks on this day! Our day finished at Pelican Brewing, which was a new restaurant for us although we have been to Cannon Beach many times. The food was amazing! I had their clam chowder and a house salad, and it was one of my favorite meals of the trip! Unexpected waterworks can happen at any time. I woke up the morning of our second day, after a rough night of interrupted sleep, and was feeling very emotional. By breakfast I was full on crying (yes, in the restaurant), and the tears would not cease until we had left our first beach. It does take a lot out of you emotionally. Worry about making yourself feel better, and try to help others understand that this is a passing emotion, thanks to hormones. By mid day, after a nap in the car, I was back to myself! Olive made a friend on the beach! After a quick breakfast at our Airbnb, we finally visited the beach three blocks away from us- Gleneden Beach! We have very high energy dogs, so we like to take them somewhere first thing in the morning where they can run out some of their energy. Although we could not get any pictures of the whales because they were so far away, we did see many! From here we headed South. After passing Depoe Bay, also known as the whale watching capital of the Oregon Coast, we were convinced we could see plumes of mist coming out of the water. We pulled off the highway at the nearest exit and found ourselves at Cape Foulweather. Another unfortunate name, another gem of a place on the Oregon Coast. Here we watched countless whales breaching and sending plumes of mist into the air. It was almost surreal, they looked so small from the high cliff we watched them from. Onwards to Cape Perpetua Scenic Area, we stopped at the same tide pools in which I found my first ever starfish! Unfortunately we only saw one lone starfish, and it was too near to the crashing ocean to venture closer. We reached Neptune State Scenic Viewpoint and I had one goal in mind: find starfish! After a disappointing start to my search, I found my first few on an unassuming rock. Fueled by the adrenaline thanks to this find, I ventured to the other end of the beach. And found countless starfish, and the most amazing tide pool life at every turn!!! There was so much marine life in these tide pools! After we had our fill of tide pool finds, we headed back up the Oregon coast, and stopped in at Luna Sea Fish House for a late lunch. If you want fresh fish, I would recommend visiting here. The waitress was very well versed with exactly what fish we were being served, where it was caught, and what is native to the area! I was able to have the fish tacos because I knew exactly what fish was in them- pregnancy safe varieties! My first purple star fish!!! We ended the day earlier than the previous few, and had a quiet home made dinner in our Airbnb cabin. Plan to do much less than you normally would on a road trip. You get tired much easier, especially when you are spending a lot of the day walking and being outside. We originally planned to drive all the way down to the Southern end of the Oregon Coast on this day, but sacrificed seeing more for being able to truly enjoy what we did see, and having a shorter day. We packed up and left the Airbnb on a drizzly morning, and after catching some really big waves at Gleneden Beach thanks to the stormy weather, we headed inland towards Portland. Goodbye Oregon Coast! We stopped at the Evergreen Aviation and Space Museum, which was of more interest to Adrian, so I stayed in the car with the dogs while he explored for about an hour. We made it to Portland in time for dinner, and stopped at our favorite Portland restaurant: La Petite Provence. It is a French bakery/ restaurant with multiple locations, and serves the most amazing brunch and small plates for dinner. The French Onion Soup is a must! After dinner we walked along the riverfront in Portland, and after four years of disappointingly long lines I finally got a Voodoo donut! To get an idea of what the donut place is all about, their tag line is: The Magic Is In The Hole. We checked into our new Airbnb and called it an early night! On our last day we woke up later as the third member of our group went on an early morning fishing expedition. Our last stop was the area that separates the states of Washington and Oregon: The Columbia Gorge. We visited as much of the Columbia Gorge as we could (some of the area remains closed due to a huge wildfire that spread through it in 2017), and started our three hour trek back to Seattle. It is super important to take frequent breaks when road tripping while pregnant. Firstly, you will need to pee all.the.time. It comes on suddenly and becomes urgent quite quickly. Every opportunity you get, use the bathroom. It is also important as your pregnancy gets further and further that you get up every 2 hours or so to stretch your legs, as you are at a higher risk for blood clots. I used every gas station and bathroom break as an opportunity to take a quick walk. Although taking a road trip while pregnant involves some accommodations, it is still very much worth it! Thanks for sharing this itinerary! I’ve taken day trips to some of these Oregon coast destinations, but now I’m trying to plan an official road trip along the coast, so this is really helpful. I’m especially excited for Cape Perpetua- never been there, but love all the animals you found in the tide pools! That’s so awesome, I hope you get awesome weather when you do your road trip along the coast- it certainly makes a difference! This was my first time at Cape Perpetua as well, but I will definitely be back! Firstly, congrats on the pregnancy! Secondly, those donuts look incredible. And thirdly, what a great trip, it looks like such a beautiful place. Thanks so much!! The donuts were really good, but soooooo filling. It was a really fun road trip! Wow cape disappointment lighthouse is beautiful. Love the stop for donuts! I don’t know how you do All that driving. The lighthouse is really cool- I always imagine what it must have been like for people to be lighthouse keepers, it sounds cool in theory but I bet it was a lonely and cold job! Luckily, my husband loves driving so he does most if not all of it on road trips! Props to you for getting out there and exploring. I think the morning sickness would stop me from being brave enough to go on an adventure. It seemed totally worth it though. Some of those beaches looked amazing and the rockpooling looked great fun (love the purple starfish). Thanks so much! This was at the start of my second trimester, so the nausea was drastically subsiding. I would not have dreamed to do this in the Summer when I felt the worst! The purple starfish was my favorite too!!! It could be sometimes difficult to travel during pregnancy and one need to take care of themselves a lot than the normal times. It can, and I felt very lucky that I was starting to feel well enough to travel again. There were some challenges but it was still doable, and baby was number one priority! Thanks so much! It is very beautiful, and often overlooked for California to the South and Seattle to the North! I love this trip, I have taken it quite a few times. I love to stay in Astoria. Thanks for sharing your memories, and bringing up so many of mine. That’s so awesome! Astoria is the cutest town, I have also stayed there many times. I’m happy to have brought up awesome memories! Ive done alot of road trips, but thinking back, none while pregnant… of course now we do long east coast trips with our kids! My son was a big car puker, so we always have bags and paper towels handy! I really want to get out to the PAC NW – I mean total goonies vibes!!!!! Oh no!!! I can imagine that once the baby arrives road trips will be that much more challenging. So awesome that you manage to get out with the kids on long trips! The PNW is the coolest place, you should definitely check it out! This is on my bucket list! Although I tend to end up using vacation weekends to fly places instead of just driving close to where I am. Oregon looks so beautiful from your photos! That makes sense, we tend to stay closer to home because we travel many places with our dogs! Oregon is definitely worth staying at home for though! Yay, I’m so glad you enjoyed my home state (despite the morning sickness)!!! 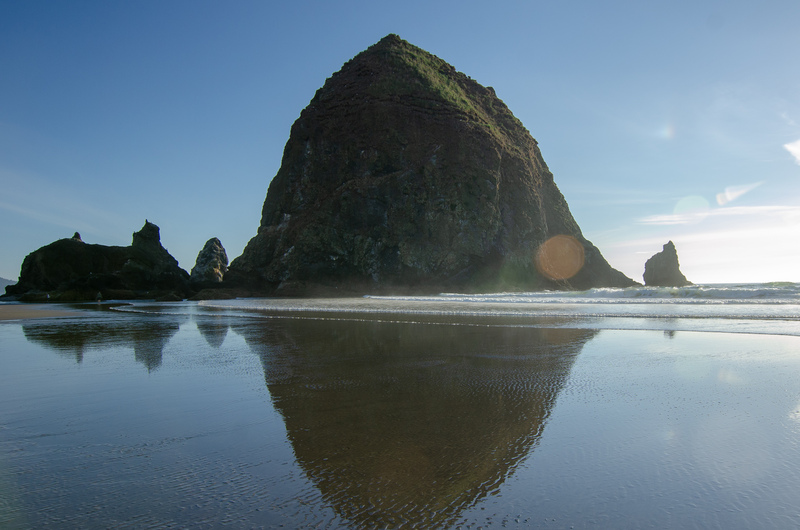 Cannon Beach is one of my favorite places on the Oregon Coast, and I try to take my kids there as often as we’re able. They love the sea lions up and down the coast! You’re lucky to live in such a beautiful state! Cannon Beach is probably my favorite beach in Oregon, and I know for sure that it is my dogs’ favorite! Lucky kids you have, getting to experience such cool nature! I love your shots of all those sea lions! One of my lifelong dreams is to go scuba diving with seals and sea lions… a girl can dream! That would be amazing! The closest I have been to them is kayaking- and that freaked me out enough. What a great roadtrip! I get the pregnant and traveling part, but it sounds like you managed pretty well. The Oregon Coast and the Pacific Northwest are some of my absolute favorite places; we’ve probably done the same road trip, though not all at once. I’ve never seen the sea lions in Astoria, we always try to go see them at or around the Sea Lion Caves; next time I’ll make it a point to go out to the docks in Astoria to see them. Thanks for pointing it out :). I’ve never actually been to the Sea Lion Caves, it is always something we pass by! I think maybe I should go check them out on my next trip. The PNW is also my favorite place! It’s on my list! We really want to check Oregon out! Doing trips while pregnant is hard but it’s def easier then traveling with a little baby lol. I did a road trip pregnant with my first. I definitely had some rough moments, but it was all worth it in the end! The Oregon coast is so beautiful. You really could spend weeks exploring the areas you went to. Glad you had such a good trip! Glad to hear I’m not the only crazy one who did this! The adjustments were small in comparison to the views and the yummy food! I loved visiting Portland! I would love to go out to the coast and explore some more of the PNW. Portland is a cool city, but I think the coast is even nicer! What a beautiful road trip to take while you’re pregnant. Looks like a peaceful getaway with yummy treats. Thanks! It was, and the yummy treats made every second worth it! This is such a helpful post for would be moms and those planning to go family way. Love your captures of the pretty sea creatures. Thanks so much! It is my first post while pregnant so this is totally new territory for me! I loved the pretty sea creatures too! Such a great road trip! Not sure I could do it with out enjoying Portland beer though! So much good food though, especially in Portland! Portland has the best food! My husband and his cousin had some pretty great beer in Cannon Beach, Oregon is filled with breweries! Really beautiful photography. I’d love to make the same trip along the coast because of all of the pictures I’ve seen. Thank you so much!! It is an amazing trip, especially at this time of year! Wow, looks like you had a great time! Your pictures are so gorgeous! Oregon looks spectacular! I especially am interested in seeing the Cape Perpetua Scenic Area, especially the sea life with all the unique starfish. Oregon tends to be a lesser explored state, but in my opinion it is one of the prettiest! Cape Perpetua is definitely a super unique place to spot wildlife! I hope you enjoy your trip! I live in Seattle, it is one of my favorite cities!!! It is my happy place too! I moved here two years ago and have not looked back since: West Coast, Best Coast!! !